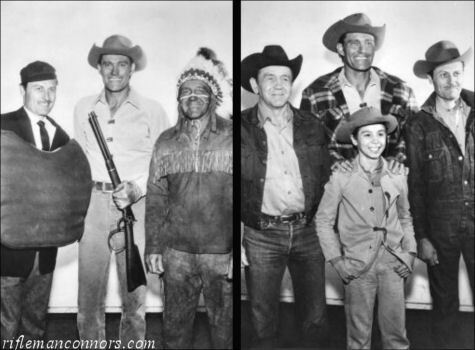 Sometimes when The Rifleman was between seasons the gang would go on The Rodeo Trail. They would do mock baseball/rifleman skits. Hollywood (NANA) ― No festa-swimming pool summer vacation for Chuck Connors this year. When "the rifleman" winds up his TV shows for the season-and it's now a certainty he'll be back next fall in the network-Chuck takes the rodeo trail. Johnny Crawford and Joe Benson, who will play umpire in a mock baseball-rifleman skit. The far he's set to appear in Winnipeg, Walla Walla, Seattle, Salt Lake and Boston at five-figure each appearances Rather than just taking a bow and saying how happy he is to be "in your fair city," he has put together a 27-minute act. 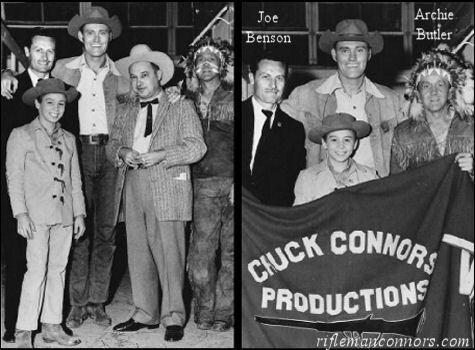 Hollywood, California ― When Chuck Connors of "The Rifleman" winds up his TV filming for this season, he hits the rodeo trail. Along with him go his TV son, Johnny Crawford and Joe Benson, who will play a umpire in a mock baseball skit. Thus far he's set to appear in Winnipeg, Walla Walla and Seattle Washington, Salt Lake City and Boston at five-figure appearances. 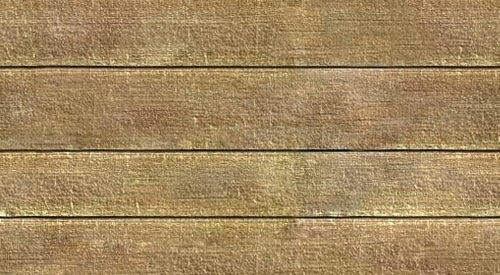 Instead of just taking a bow and saying how happy he is to be "in your fair city," he has put together a 27-minute act. Temple city -- Every year some hero of the community of youth leads the Camellia Festival Parade of children and child size floats, and this year it will be a 13-year-old television cowboy. Johnny Crawford who cavorts hero-style every week on ABC's "The Rifleman," will be Grand Marshal when the marchers start down Las Tunas Dr., Feb 27. Johnny also has one of the other major qualifications for a Grand Marshal. He is at ease aboard a horse. That was a skill that required a high polish on the job. For this reason and because of a long history of theatrical experience, Johnny expects to enjoy riding out in front of the Temple city's 16th annual parade of youth. Way back in 1955 he was one of the original Mouseketeers for the Walt Disney Mickey Mouse club. He has always, as he admits, loves to "get in the act." When the big Saturday morning festivities get under way in Temple City, Johnny will be up on a bay mare named Vickey belonging to Dutch Manning of Arcadia. Vickey is a parade horse. Manning, a member of the Long Beach Mounted Police Posse since 1939, has been seen on her several times in Pasadena's Tournament of Roses procession. "She'll love it," says Manning of his animal. "She always does." The fact is, some members of the committee are wondering if the Feb. 27 parade won't be easier on Vicky than Johnny. Huge live audiences are old hat To her. For Johnny there's never been anything quite like this.